Photograph taken from a Japanese aircraft during the initial high-level bombing attack at 1113 hours on HMS Repulse. 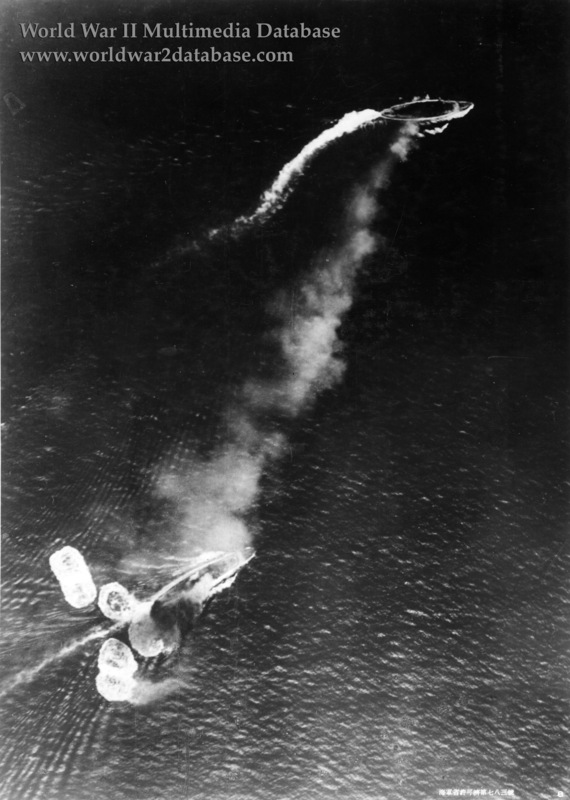 Repulse, near the bottom of the view, has just been hit by one 250 kilogram (551 pound) general purpose bomb and near-missed by eight more. Seven missed to port and one to starboard. Prince of Wales is near the top of the image, generating a considerable amount of smoke. At 1100 course was altered to 135 degrees, bringing the heavy ships into starboard quarter line. Admiral Sir Tom Phillips attempted to control both ships via flag signals, resulting in their anti-aircraft batteries being partially or fully masked by the need to keep in line. A few minutes later nine Japanese Type 96 land-based attack bombers of the Mihoro Air Corps from Saigon, Vietnam were sighted approaching from the starboard bow, flying at about 10,000 feet. All ships, except the Vampire, which was outranged, opened fire at 1113. The enemy concentrated a high level bombing attack on the Repulse without worrying about the anti-aircraft; Repulse's 4-inch (101 millimeter) was obsolete. One bomb hit the port hangar, bursting on the armor below the marines' mess deck at 1122. This caused a fire in the catapult deck and fractured a steam pipe, but no damage was done to the engine or boiler rooms and the fire was rapidly got under control. Repulse maintained her 25 knot (46 kilometers per hour) speed. The bomb hit caused concern aboard Phillips's staff on Prince of Wales and heartened the Japanese. Phillips ordered his ships to operate independently, but his force had hours to live. Repulse was sunk at 1223 and Prince of Wales at 1318. Japanese writing in the lower right states that the photograph was reproduced by authorization of the Navy Ministry.